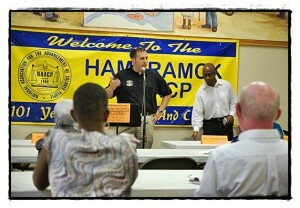 Police Chief Max Garbarino speaks at a recent Hamtramck NAACP meeting. 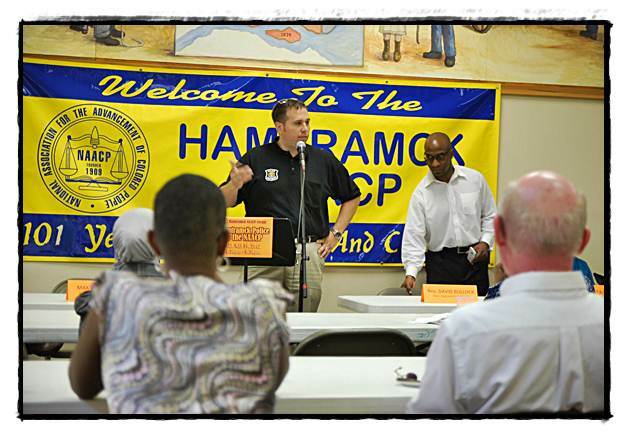 As far as anyone knew, no Hamtramck police chief has ever agreed to meet with the Hamtramck NAACP, said Bill Meyer, a member of the organization. Well, maybe in recent history. Nevertheless, that comment was meant as a compliment to newly-appointed Police Chief Max Garbarino, who met with the Hamtramck NAACP on Saturday at People’s Community Services on the city’s southend. Garbarino, who is also possibly the youngest-ever police chief in the city’s history, apologized for taking so long to accept the offer. “This has been a long time in coming,” he said. Well, not in a historical context, but in the sense that several months before he was named chief, he held the role as acting chief until a police department labor dispute was settled – namely who would be appointed as chief. Garbarino said he held off meeting with any group until the matter was settled. And now, it is all settled. The late afternoon event began with a litany of grievances from Juanita Sephers, the President of the Hamtramck NAACP. For years, blacks could not get a city job. “You had to know someone,” she said. In all of city hall today, she said, there is only one black employee. There is also no black firefighter in the Fire Department, although the one black person who was in the department recently retired. Students were released early one day from Dickinson West Elementary School, at that time located at St. Lad’s former school building, and were patted down by police for no apparent reason, she said. A local minister (The Rev. Little), she said, was arrested after inquiring about a police investigation into youths regarding a break-in. Turns out one of the youths being questioned was Little’s nephew. Rev. Little was subsequently arrested for interfering with officers. “That wasn’t right either,” Sephers said. “I could go on and on, but I’m not,” said Sephers. He said many of these issues could be resolved simply: Explain to the public what happened. As for the hiring of more minorities in his department, Garbarino conceded minorities indeed are underrepresented. He added that will change. Next up was Congressman Hansen Clarke, who up to this year had been representing Hamtramck in the 13th District. He has been redistricted to the 14th District and is running against Congressman Gary Peters. Clarke is the son of a Bangladeshi father and African-American mother. Both, he said, worked hard to support him, and both died while Clarke was young. Clarke said the country’s police agents have to stop profiling minorities. He said even in Washington D.C. he is pulled over by Capital police. He also said there is a new “Jim Crow” law in the nation, and that is blacks are disproportionately jailed for drug offenses while their white, suburban counterparts are given, basically, a get out of jail card. Interestingly, there was a representative from the FBI office, a young Muslim woman, who nodded in agreement. Raphael Thurin, of the Hamtramck Community Initiative, focused on the power of block clubs in preventing crimes. Garbarino agreed and encouraged residents to join block clubs. “That helps us to patrol … and keeps the city safer,” Garbarino said. Garbarino expanded on his vision for the department. He said he does not want the department to be “walled in” and isolated from the community. He said later in the meeting that often his officers feel “under-appreciated” by the community. “They feel like they are going to be attacked,” he said. Titus Walter, a member of the Hamtramck School Board, who is also African-American, said the meeting with Garbarino was a good start. “There’s more than just one problem,” he said.